Please welcome today's guest author Donald Allen Kirch. Donald is the author of Manchester House , Still Waters , The Silent Pulpit , and Reich. Editor's Note: With thanks due to the official News Agency of Norway and the British Broadcasting System for help in research. LILYHAMMER, NORWAY - The nation and people of Norway, recovering from the invasion and takeover by the Axis Powers, has within its dark caverns serious rumors and secrets that have only recently come to light. From the land of Norsemen, daring voyagers, and mythology, there are whispers of a more recent monster - Adolf Hitler. The "Stars & Bars" is dedicated to the truth, but when it came to seeking the facts on this one, our reporters had a difficult time trying to accept what was being sold to them. The town's name is not known. If it were, the people would not relate it to this reporter. All that is known, and had been felt, was an abject horror. The kind of feeling one tries to ignore, telling them that it never happened, or worse, that it couldn't happen here. The rumor? That Adolf Hitler did not die within the depths of his bunker, as the Soviet Army has testified. The leader of Germany's Third Reich perished within the cold waters of Norway. On any other given week, this information would have been laughed out of an editor's office. However, not too long ago, a wine bottle had washed up upon the Danish coast, containing inside of it, a torn-out page from a German u-boat's captain's log. A fantastic tale had been written on this page - Hitler died within the hull of a submarine called "NAUCELIUS." Facts...seemed to point to Berlin. Testimony...pointed to six people killed in Norway, including the mysterious and bloodied death of that nation's greatest traitor - Quisling! At first, no one would talk about the rumors. Some pointed our attention to a retired priest named Father Francis Donavon. Father Donavon looks, by all accounts, to be a passive follower of the Catholic Church. He is a native of Ireland, and has seen his fair share of blood and death before being assigned by his faith to these foreign shores. After careful diplomacy with the Holy See, in Rome, this paper was allowed a visit with the priest in question. Note: Father Donavon did not agree to this interview, but was ordered by his offices to oblige. We thank him for his efforts and wish him well in his retiring years. STARS & BARS: Father Donavon...I understand that you had taken part in a fantastic adventure during the closing days of the last war. DONAVON: I agreed to this interview, Mister Reporter, to put aside all this nonsense I have been hearing since last week. If that is what you want to know. STARS & BARS: Father, is there any facts to the rumor that the Nazis had secretly sent Adolf Hitler to this nation before his final demise, and that he truly died within a u-boat off Norway's coast? The priest sat silent, almost in shock. It was this reporter's opinion that Father Donavon was taken by surprise. DONAVON: I have no idea what you are talking about, son. As far as I know, he was killed by the Russians in his bunker, in Berlin. STARS & BARS: He committed suicide, sir. STARS & BARS: According to the Russians, Hitler committed suicide before he could be taken prisoner. DONAVON: Well, couldn't have happened to a nicer man! Looking around the priest's humble quarters, one got the impression that he lived alone. Books lined his walls of ancient texts on religion, and family pictures of his niece, Kate, standing next to a young man the priest claimed to be her husband. He would not give the man's name, nor would he say anything about them, except that they had both "moved to the States." STARS & BARS: Father Donavon, have you ever heard of a German u-boat called the "Nauecilus?" STARS & BARS: Never? There are records from the military bases, that a priest named Donavon had been questioned by the Norwegian Home Guard, after both he and two men had been discovered coming ashore right after the alleged theft of such a submarine. DONAVON: I was out fishing with a few lads, and we tipped over. If it had not been for the fast thinking of my friend, we would have all drowned. Now, if you knew about that, you certainly read our statements from the event. The government believed the story. STARS & BARS: Was it that, father? A story? DONAVON: I am not in the habit of being called a liar in my home, son. One more remark such as that and Christian or no, I'll show you both the door and the back of me hand! STARS & BARS: I am just looking for the facts here, sir. DONAVON: Oh, sir, is it, now? A child roared down the hallway of the housing complex we were in, flapping a homemade kite behind her. This reporter had noticed a certain amount of fear raise within the old priest's eyes upon hearing the noise. This was not the look of a common man's fear, but that of a man who had seen and survived pure evil. A certain "distance" was observed within his stare, only associated with those in combat. STARS & BARS: Father, there were listed, within the official records of the Norwegian Gestapo, six associated deaths, connected with the rumor of Hitler's visit. DONAVON: The man never came here! Have you not been listening to me? STARS & BARS: (We produced a copy of a secret order, signed by Himmler) I have an executive order, here, signed by Himmler, ordering a submarine, named "Nauecilus" to Norway, carrying within "an important diplomat." Or course, this u-boat is registered as destroyed in the North Atlantic, but others claim it did arrive, and it carried Adolf Hitler. Question: did you make contact with this crew? Donavon refused to answer. However, he remained remarkably calm, considering his actions from before. This reporter was well prepared for the "back of his hand," upon asking such an inquiry. DONAVON: Why are you here? STARS & BARS: To seek the truth on our story, sir. DONAVON: No. WHY are YOU here? I have done my duty for both king and church. I need not listen to silly stories about monsters. STARS & BARS: Monsters, Father? We claimed nothing about monsters. Since you brought it up, we have heard stories from the locals about...vampires. Are there such things as vampires, Father Donavon? At this time, the priest shouted and threw this reporter out of the small apartment. A week later, while preparing to fly back to London, and then to Europe, Father Donavon called to apologize. This reporter was sent back to the old warrior's home. Father Donavon should not be looked upon as an Old Catholic Priest who has gone mad, but as a hero. He worked closely with the Norwegian underground, and played a part in the general freedom of her people. One of his closest friends, a fisherman by the name of "John" called him "a guiding influence in his life." DONAVON: I would like to begin by apologizing for my behavior last. The war was hard on most of us here, in Norway. The Nazis were a cruel landlord. STARS & BARS: Think nothing of it. Perhaps it was an awkward moment best left alone. DONAVON: You made reference to the claim of vampires. DONAVON: Well, they do exist. There is evil in this world. STARS & BARS: And...Hitler? Was he ever here in Norway? DONAVON: As I have stated from before, I have never met, seen, nor heard from Adolf Hitler. I am just thankful that he is gone. Hidden in the deep and cold where all good secrets should be. DONAVON: Hidden. And that's the end of the questioning. God be with you, my son. One curious note: About a week after this interview, both Father Donavon and his fisherman friend "John" left for London. It was explained by the offices of the Holy See, that Donavon had been asked to return home to Ireland. As a matter of record "John" took up the job of assistant, helping the priest with his next mission. The rumors of a visit by Adolf Hitler still persists. Records show medical doctors trying to save several attacked German soldiers, who all suffered from a massive loss of blood; some had broken necks, and even evidence of having been eaten upon. There were stories of young couples being killed in barns and of family dogs lost - never to be seen again. Is there evil left in this "atomic" world we have inherited after the Japanese surrender? Could Hitler have been this "monster?" This "vampire?" Adolf Hitler killed himself in the dark confines of his bunker in Berlin. The Soviets took over the remnants of his broken empire shortly after the coward pulled the trigger. For more, read the horror novel "REICH" by Donald Allen Kirch. Adolf Hitler, the “Supreme Warlord” of Germany’s Third Reich ruled Europe with an iron fist. With his political promises to a desperate people, he spoke of a reign that would last a thousand years. Under his command humanity had entered a new dark age. Tales were told of horrors taking place in the East – of railroad cars, of ovens, and death. Still, there was one little secret he had kept to himself. When Hitler survived an assassination attempt upon his life his secret was discovered by those in command. Something had to be done! A German U-boat Captain is ordered to transport Adolf Hitler to a secret military base in Norway, during the closing days of the Second World War. While on this mission, he discovers that there is more to Germany’s “Supreme Warlord” than meets the eye. To his horror, the Captain discovers the Third Reich’s darkest secret: Hitler was a vampire! Thank you Donald for joining us here today at From the Shadows! 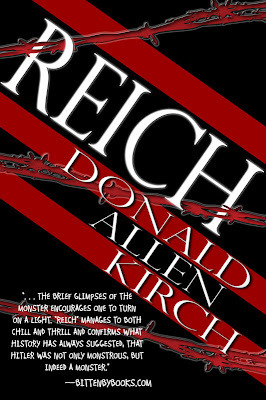 To learn more about Donald Allen Kirch and his books, please visit his website. Also, don't miss our author interview with Donald here at From the Shadows. If anyone is interested in seeing the Book Video to this title go to this link!